“What a piece of work is a man! There is a tribute which would reflect on his diversified aspects of life, that is, literature, diplomatic brilliance, ability and commitment in handling public affairs and interfaith movement. With all the humility at my command, what I have read about late Dr. L.M. Singhvi and heard him once when he came to Cuttack to address in a seminar while he was the High Commissioner of India to the United Kingdom and my brief interaction with him as a young lawyer is that he was a rainbow of intellect and embodiment of individual dignity that strived for collective good. He eloquently spoke about the great traditions of this country and firmly believed and acted for independence of judiciary. I am extremely honoured and delighted to be invited to deliver the fifth annual memorial lecture. The Indian justice system is reflective of majestic legal order. It has a history that excites one to travel to the Vedic era. Reflection on the past has its relevance as it connects us to our past, especially the cultural foundation. We continue to harness such archived principles in resolving issues concerning law and culture to prevent a conflict between the straight jacket principles of law and the traditional cultural values in the society. The Mimansa Rules of Interpretation which are a part of great intellectual treasury were used in the cases of Vijay Narayan Thatte , Gujarat Urja Vikash Nigam Ltd. and many others. Undeniably, we have travelled far in the pursuit of conceptualising the true import of ‘Dharma’ and facets of ‘Justice’ for a coherent social order. The present form of the Indian justice system receives a constant gravitational pull from our organic and compassionate Constitution of India. The Constitution of India remains the foundation text of the post-independent Indian justice system and the Constitution has undergone substantial amendments in order to upkeep with the emerging legal necessities of a dynamic society to fulfil the aim and ambition of the collective. The Supreme Court of India has been responsive to the changes in the Indian society by employing the tools of interpretation. This has been largely done by expanding the meaning of the Constitution of India in favour of different segments, especially the poor and marginalised sections of the society. This approach of the Indian judiciary gradually became its reflection of a progressive judicial institution. ‘Progressive Thinking’ outlines what we believe as progressives and how we view the world. It is designed to help our nation’s diverse progressive community and articulate a common philosophical values framework to a wider public. It is with these conceptual foundations and the fashioning of innovative instruments by the process of interpretation, the court has broadened the arena of human rights. The Indian judiciary has not confined its shielding umbrella to its citizens only but has offered the constitutional protection of life and liberty to non-citizens as well. In Khudiram Chakma it has been held that protection of Article 14 and Article 21 encompasses extra-terrestrials too within its purview. The Court restrained the forcible expulsion of Chakma refugees from the State and directed the State Government to ensure that the Chakmas situated in its territory are not ousted by any coercive action but in accordance with law. And any attempt to forcibly evict or drive them out of the State by organized groups should be repelled by using paramilitary or police force. This decision is most significant considering the fact that India is not a party to the International Convention on the Status of Refugees. The Court ruled that there is a growing recognition that the true measurement of development of a nation is not economic growth; it is human dignity. “Fraternity as a concept is characteristically different from the other constitutional goals. It, as a constitutional concept, has a keen bond of sorority with other concepts. And hence, it must be understood in the breed of homogeneity in a positive sense and not to trample dissent and diversity. It is neither isolated nor lonely. The idea of fraternity is recognised as a constitutional norm and a precept. It is a constitutional virtue that is required to be sustained and nourished”. “One may feel “My honour is my life” but that does not mean sustaining one’s honour at the cost of another. Freedom, independence, constitutional identity, individual choice and thought of a woman be a wife or sister or daughter or mother cannot be allowed to be curtailed definitely not by application of physical force or threat or mental cruelty in the name of his self-assumed honour. That apart, neither the family members nor the members of the collective has any right to assault the boy chosen by the girl. Her individual choice is her self-respect and creating dent in it is destroying her honour. And to impose so called brotherly or fatherly honor or class honor by eliminating her choice is a crime of extreme brutality, more so, when it is done under a guise. It is a vice, condemnable and deplorable perception of “honour”, comparable to medieval obsessive assertions”. Making the legal study truly dynamic in character, the judiciary has borrowed intellect from the non-legal disciplines in interpreting critical legal issues especially in the matters relating to science and technology, society-oriented issues concerning law and religion. Flexibility is the norm of interpretation of constitutional ethos has been introduced in the sphere of new emerging situation and the duty of the court is to adapt the law to suit the changing needs of the time. This very principle has been expressed by a famous American jurist Ronald Dworkin by saying that we must draw a distinction between a concept and conception. The concept may remain constant but the conception must change according to the needs of the time. For example cruel and inhuman punishment is a concept. But its conception can keep changing with the changing time. The examination of the implications of Court’s innovations for environmental jurisprudence reveals that the application of innovative methods to resolve environmental disputes and implement Court orders is certainly different from the usual adjudicatory function of the Court. While the procedural innovations such as Public Interest Litigation (PIL) have widened the scope for environmental justice through recognition of citizens’ right to healthy environment, by substantive innovations have redefined the role of Court in the decision-making process through application of environmental principles of expanding the scope of environmental jurisprudence. In resolving more than 100 environmental cases since 1980, the Supreme Court has continuously engaged itself in the management and resolution of environmental conflicts and thereby increased the country’s dependence on the Court for environmental protection. Today India offers a comprehensive Intellectual Property Rights regime through the IP laws enacted beyond traditional Intellectual Property of Patents, Copyrights and Trademarks. Some of these includes Intellectual Property Protection to –Geographical Indications, Plant Verities and Farmers Rights, Semi-conductor Integrated Circuits Layout Designs, Biological Diversity and Protection of Seeds. The apex Court has enhanced this safety, security and stability further by the doctrines enumerated in the umbrella of fundamental rights. These are rights that are intrinsic to or necessarily flow from fundamental rights in the Constitution. This has come in due to application of techniques for a life having respect of human dignity. The “Novartis” case presented the Court with an opportunity to lay down the law on several fundamental aspects of the Act; Relationship between “Invention” and “Patentability”. The Court also had the occasion to deal with the law on disclosure and anticipation; position on Incremental Innovations and working of patented inventions. The Indian jurisprudence on right of privacy is still in developing stage. But given that privacy concerns have been plaguing citizens across the world, it becomes increasingly important to address the same so as to give individuals control over their personal information and the opportunity to give an informed consent for the use of the same. The right to privacy is not constitutionally protected right but judicially interpreted and derivative fundamental right. In R. Rajagopal it has been held that the citizen has the right (also described as the right to be let alone) to safeguard the privacy of his own, his family, marriage, procreation, child-bearing and education among others and that nothing concerning these could be published without consent, except if a person voluntarily thrusts himself into a controversy or any of these matters becomes part of public records. The year 2015 was very significant for the development of cyber law in India, when the Court in Shreya Singhal while upholding freedom of speech and expression, struck down section 66A of the Information Technology Act, 2000. Section 66A defined the punishment for sending “offensive” messages through a computer or any other communication device like a mobile phone or tablet and a conviction of it can fetch a maximum three years of jail and a fine. Over the last couple of years there had been many cases in which police has arrested the broadcasting of any information through a computer resource or a communication device, which was “grossly offensive” or “menacing” in character, or which, among other things as much as cause “annoyance,” “inconvenience,” or “obstruction.” The Court has now declared that Section 66A is not only vague and arbitrary, but disproportionately invades the right of free speech. I must make it clear that decision does not deal with obscenity or defamation, and rightly. The ongoing decade has witnessed India as an arbitration friendly destination. The Bharat Aluminium Co. has set the tone for India to compete globally in boasting as the destination practising greater judicial deference towards foreign seated arbitration and also this case declared Indian arbitration law to be Seat-Centric. In the year 2013, the judiciary paved a way for referring non-signatories to an arbitration agreement to settle disputes through arbitration in the case of Chloro Controls (I) P. Ltd. . The Court held that the expression ‘person claiming through or under’ as provided under Section 45 of the Arbitration Act would mean and include within its ambit multiple and multi-party agreements. This judgment has a far-reaching positive effect especially in the cases of international commercial arbitrations involving composite transactions and multiple parties. The Court has also narrowed down the scope of public policy and moved closer to adapt to the modern legal requirements and further the Court has eased the arbitrability of cases involving allegations of fraud for referring such matters and parties to foreign seated arbitrations. The trend of such pro-arbitration judgments delivered by the Indian judiciary is on the rise and the Court is constantly stabilising the global normative best practices of international commercial arbitration in India. The development of jurisprudence can be divided into different eras. In the first fifteen years, the Court was quite conservative. Thereafter, there was the era which concentrated on rights, but the interpretative process was not progressive. In the 1970s, the Court played a balancing role and the concept of federal structure, as is understood in the Indian context, was maintained. However, in ADM Jabalpur case , the Court held that no one approach the court to enforce their rights during emergency and that corroded the balance. That decision, in the ultimate eventuate, constrained the Court to redeem itself, and in the transformed role, it changed its perception and took a pro-poor and pro-right stand. The post emergency era, and 1980s witnessed numerous cases which involved progressive interpretation of the Indian Constitution. It adopted a ‘progressively interventionist’ role in the state’s affairs especially with regard to socio-economic rights and Part IV of the Constitution served as a tool. The PIL jurisprudence including the epistolary facet evolved around mostly Social Action Litigation in India. Prof. Upendra Baxi remarks that in 1980s the Supreme Court of India became Supreme Court for Indians. Justice Bhagwati and Justice Krishna Iyer recognised the possibility of access to justice to the marginalised people through PILs by going beyond the conventional concept of locus standi for enforcing social justice. The principle that surfaced is that the law has to be in tune with the time and the Court should appreciate the grievances and if incidentally the law is lagging a little behind in time because of inertia, the judge has to be thoughtful enough to give a progressive interpretation so as to make up the legislative lacunae. The socio-economic needs of marginalised groups were treated as integral to the fundamental ‘right to life’ under article 21 of the Constitution. The Court started creating unenumerated rights by making broad interpretations of article 21. The guarantee of right to life is now not limited only to the right to live or breathe or even to the security of the limbs and senses of communication rather it includes everything which makes a life livable having environmental purity. A progressive interpretation of the Court has widened the right of free expression. There has been a traditional meaning of freedom of speech and expression and that was there already which the Supreme Court adopted in its earlier decision of Romesh Thappar and Indian Express Newspapers . These two rulings were adopted by the Supreme Court of India in R Rajgopal (supra). Justice Jeevan Reddy who spoke for a two judge bench adopted the observation of Justice Brenan of the American Supreme Court that in democracy there should be a right to criticize even in a biting manner. In S. Rangarajan , the Supreme Court held that there was a right to dissent and that the right to free speech does not merely mean the expressions which are complementary to the majority or to the rulers of the day. In Kushboo’s case, the Supreme Court held that this right of dissent was not limited to political or social dissent it also embraced moral dissent. Earlier in Hamdard Dawakhana (Wakf) Lal Kuan the Supreme Court had held that right to speech and expression under article 19 (1)(a) was limited only to political and social speech and did not embrace commercial speech. In this case the question was the permissibility of publication of certain advertisements of Hamdard Dawakhana which under the law could not be published. That it was an attempt to publish and illegal commercial speech. But the observation was wide enough to include all kinds of commercial speech. Consequently the Supreme Court felt the need of the hour and in Tata Press Limited held that the decision in Hamdard Dawakhana case must be held to be limited to the kinds of facts that existed in that case. The concept of free expression extended the boundary in PUCL vs. Union of India where the Court held that the right to speech and expression under Article 19(1)(a) is in play when a voter goes to cast his or her vote. In order to make that exercise of right meaningful the voter should be held entitled to know certain qualifications of the candidates concerned. This ruling of the Court connects right to speech and expression with the democratic political process of election is pregnant with many possibilities. It can be read in the light of other provisions of the constitution as providing for a right of political participation. The political participation is partly done by exercising the rights of speech, assembly and association. The next era of the Court witnessed a slight re-thinking in its pro-poor perception especially relating to regularization and consequential benefits. The economic liberalization saw its reflections in the judgments of the Court. It was thought there has to be corporate and industrial growth to have a real global economic identity. In the contemporary era, there is an apparent influence of globalisation in the Court’s decisions. “….that all practices derogatory to the dignity of women are to be renounced. Be it stated, dignity is the quintessential quality of a personality and a human frame always desires to live in the mansion of dignity, for it is a highly cherished value”. In Krishna Bhattacharjee , the concept of ‘domestic violence’ and the ‘locus standi’, especially, pertaining to “stridhan” was expanded on the ground that it covers a range of violence which takes within its sweep “economic abuse” and the words “economic abuse”, as the provisions would show, has many a facet. The jurisprudence relating to election law took a quantum leap in Association for Democratic Reforms wherein it has been held that the citizens have the right to know the antecedents of the candidate standing for election when they file their nominations. In Resurgence India v. Election Commission of India , the right to know further got accentuated and in People’s Union for Civil Liberties v. Union of India , the Court expressed the view that to have a vibrant democracy, the concept of negative voting was declared as the felt-need of the hour. In Krishnamoorthy , the Court further elaborating the principle, ruled that the requirement of a disclosure, especially the criminal antecedents, enables a voter to have an informed and instructed choice and if a voter is denied of the acquaintance to the information and deprived of the condition to be apprised of the entire gamut of criminal antecedents relating to heinous or serious offences or offence of corruption or moral turpitude, the exercise of electoral right would not be an advised one. He will be exercising his franchisee with the misinformed mind. That apart, his fundamental right to know also gets nullified. The attempt has to be perceived as creating an impediment in the mind of a voter, who is expected to vote to make a free, informed and advised choice. The same is sought to be scuttled at the very commencement. Thus this progressive vision of the Constitution is nothing but progressive judicial hermeneutics. Here comes a pregnant, but definitely a significant one. There is still a need to bring further change in the orientation of judiciary to bring about social reform and contribute to good governance. As per the United Nation’s Commission on Human Rights, the key attributes of good governance include transparency, responsibility, accountability, participation and responsiveness to the needs of the people. This is, thus, linked to an enabling environment conducive to the enjoyment of Human Rights and promoting growth and sustainable human development. This change in the orientation of judiciary has to be guided by the constitutional vision of justice embodied in our Constitution. The doctrine of equitable access to opportunities for growth; affording participation and capacity to influence, in the decision-making in public affairs has to have priority. There is a need to ensure a responsive judicial system which dispenses justice in a meaningful manner and it ensure the protection of rights by upholding the rule of law. 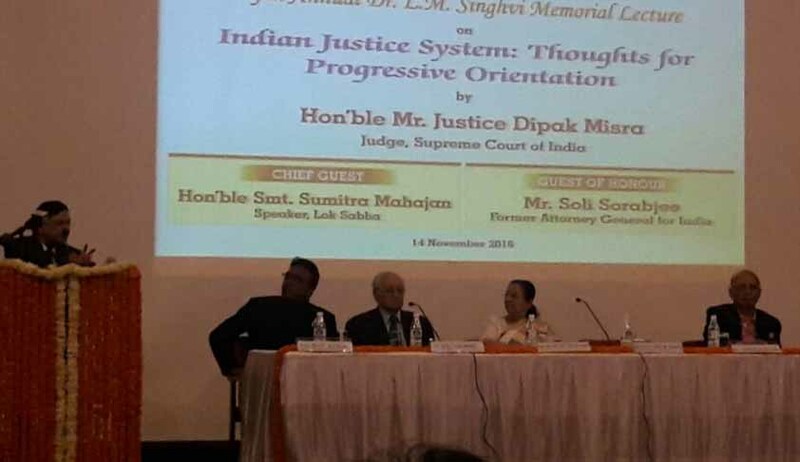 For improvement of the Indian Justice system there is need for reorienting the attitude of the Bar. The court system is alien to the common man in society. This may be attributed to the formal adversarial system we follow or to the structured court process mostly in a language not understood by the common man in society. The reverence and faith of the public in the judge and the justice delivery system is essential to maintain the sanctity and in turn strengthen the judiciary – which is the last bastion of public reliance. Here lawyers play an important role in portraying the right image of the judiciary. The common man who visits the courts forms an impression about the legal system and its functioning from his lawyer who in a way introduces him to the system and its functioning and helps him form an impression about the same. The lawyer as an officer of the court has the duty to instruct and educate his client about the justice delivery system. The lawyer plays the crucial role of upholding the majesty of the justice delivery system which in turn is so crucial for strengthening the judiciary as the strength of the judiciary lies in its orders being respected and executed. Lawyers need to remind and reorient themselves to the role expected of them. Here it would be essential to remind ourselves that it is only an ethical bar that can set standards and check faults in the justice system. For this the bar has to instill in its members ethics of honest practice of law. There is also the need for Judges to reorient their way of functioning and change their attitude to involve the common man as a litigant who appears before him. The judges today need to work towards removing the alienation the common man feels by changing their attitude and considering themselves as the representative of an institution that dedicates itself to the serviceability and work for the satisfaction of the people who come to Court. Judges have to understand that they have a social responsibility to ensure effective and efficient Justice, assure legal aid to the poor, bring transparency in judicial affairs take active and continuous interest in the economic social welfare of society through dispensation of justice. The Justice system is respected only if it continues to make itself relevant and regains the faith of people in its efficiency. The judicial administration has to revamp itself with times to increase its efficiency. It does not help to deny that there is no need of re-engineering its processes by optimizing the use of its human resources and bring about change management by harnessing the potentiality of the available Information and Communication Technology (ICT) to its fullest extent to enhance judicial productivity both qualitatively and quantitatively as also make the justice delivery system affordable, accessible, cost effective, transparent and accountable. There is need for further 'informatisation' in the administrative and management process of courts, to usher in 'transparency'. The application of video conferencing facility, from the court to the prison where the under-trials are housed, has to be enhanced to take care of many delayed trials. Video conferencing service will not only help in avoiding unnecessary adjournments of cases but also would be cost-effective. Another effective measure can be the use of technology to collect information like the timeline of a case from the time is was instituted in a court of law to the final stages of appeal. Building up a judicial database like this will enable us to assess the performance of the courts, and this can be used to assess the individual performance of judges. This will go a long way in identifying what the backlog is and what types of cases are clogging the system. By maintaining a good and detailed case database we can also do things like track old cases, many of which have become meaningless, can be separated and listed for hearing and their disposal normally will not take much time. Same is true for many interlocutory applications filed even after the main cases are disposed of. Such cases can be traced with the help of technology and disposed of very quickly. Another aspect needs to be noted. The filling of number of volume of documents which are not necessary should be scrupulously avoided. Whatever may be the reasons, it needs to be avoided. The progressive constitutional vision is that of a strong nation deriving its strength from the masses, and their shared beliefs of equality, individual freedom and democracy. It is abundantly clear by now, owing to the theme under discussion being progressive orientation, and arising from the fact that India is the world’s most populous and promising democracy, apart from being the world’s biologically youngest nation, the democratic and participative vision as far as they are constitutionally permissible should be welcome. The values that any system needs to cherish for progressively orienting itself are hope, engagement and empathy: hope to emerge better on embracing this concept, engagement with its key target beneficiaries and finally, empathy, without which true justice cannot flow. While holding these values in an exalted position, it is crucial to note that the concept of progressive orientation whether with respect to an individual or a system comprises four essential dimensions, each of which must be paid due attention so that the whole turns out greater than the sum of its parts. These dimensions are the “physical”, “mental”, “spiritual” and “social”/”emotional” dimensions. The Indian justice system is a like a house with these four rooms which constantly require healthy ventilation. Just like a body needs exercise, nutrition and stress management, in the context of the judicial system this would translate to the court’s physical infrastructure; caring effectively for the physical body of the system, by supplying it with the right nutrition, that is, focussing on organisational framework and performance metrics. These attitude shall ensure endurance and flexibility for the purpose of stretching the system in tune with fast-building needs to accommodate the diverse concerns. The mental dimension in Indian justice system would entail the need to have constant legal education, be them judges, lawyers, court officials, etc., polish their crude edges in an endeavour to ensure faster, better justice, evolving to fit in the new concerns of a fast changing society. The social/emotional dimension would involve working with a sense of service, empathy, synergy, and with the confidence of intrinsic security. The Indian justice system, in order to achieve progressive orientation under this dimension must function bearing in mind who it is serving justice to: it works to provide justice to not just the world’s largest democratic population but also a very diverse population base with vastly different and ever-changing conceptions of justice, based on their economic/ social segments. Hence, the need for empathy and a sense of duty towards the law for discharging of functions. The spiritual dimension focusses on value clarification and commitment. This element may be said to comprise the core in terms of its importance as it embodies the justice system’s commitment to certain central Constitutional values, those which must always be borne in mind while delivering judgments. In the context of legal professionals, these values could be well summarised by Judge Abbott Parry’s seven lamps of advocacy: honesty, courage, industry, wit, eloquence, judgment (good discretion) and fellowship. Hopeless of God and Man”. 23. From Stephen R. Covey, The 7 Habits of Highly Effective People (1989) where the 7th habit of sharpening the saw, deals with these four motivations.